Promotion of Product plays a key role to enhance the growth of any business. It leads to increase the attention of customers and ensures profit in business. If you want to promote the products of your POS store then here we have introduced our module “Odoo Promo Messages On POS Receipts” which will fulfill all your need. 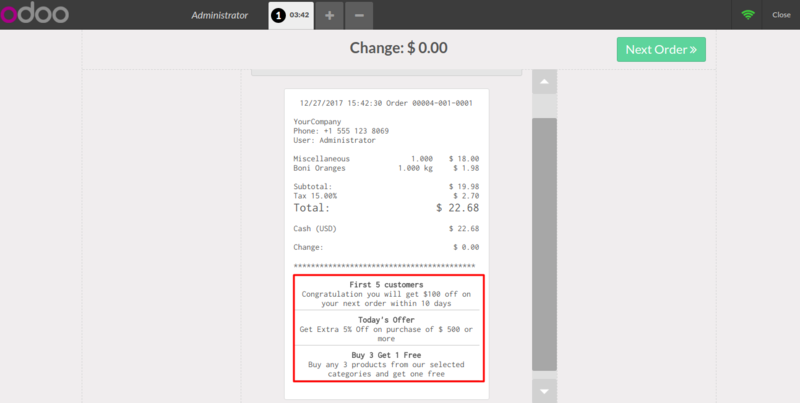 Using our module “Odoo Promo Messages On POS Receipts”, you can define different promo messages based on several criteria like- For every New Customers, For every order etc, to promote your product and accordingly that promo message will print on the POS Receipt. You can provide additional offers to your customers, also you can take surveys using promotional messages. You can promote your products by printing a promotional message on POS Receipt. POS Manager can take surveys via means of promotional messages printed on the POS Receipts. POS Manager can give additional offers to the customers by printing offer as promo message on Receipt. Promo messages will be printed on both POS Ticket as well as on XML Receipt (POSBOX). After buying this app from our Webkul store you will get the link for downloading the zip file. Download it and extract, you will see the pos_promo_messages_on_receipts folder, now you will have to copy this app folder inside your Odoo addons path. For Linux user:- Set the correct permissions and ownership of this app folder. 1. Go to settings menu and click on “Activate the Developer Mode”. 3. Remove the app’s filter and search for the pos_promo_messages_on_receipts. 4. Now you will see the module, then simply install it. After installing you will be able to handle different functionality as mentioned in module’s workflow. In order to promote your product create Promo Message and define particular criteria for the promo message. Define a proper “Title” for Promo Message and “Type of Criteria” on the basis of which the promo message will be printed on POS Receipt. Now select POS on which you want to display this promo message, also the “Description” field message will be shown on POS receipt. Customer attention plays a key role in promoting your product. Therefore, using this module you can define promo message for every new customer. For example, Print welcome message or some attractive offers so that customer will visit your store again. Here you can define promo message for every X(order number) Order of POS Session. For example, for every 10th order per POS session, promo message will print on POS Receipt. Similarly, you can print promo message for the first X(number of customers) customer of a particular POS Session. For instance- For first five customers per POS Session, a promo message will be printed on their receipt. You can also define Promo message for specific product items, it means only on the sale of those selected items promo message will be printed on the POS receipt. Here you can create Promo message for POS Categories so that when a customer purchase product of those categories then a promo message will print on the receipt. Also, using this module you can print promo message on every Order receipt. If you wish to provide offers to your customers on any special occasion, for example, “Christmas”, then using our module you can fulfill it. A Promo message is defined on the basis of specified date which is printed on the receipt accordingly. You can define Promo message for a particular product so that when a customer purchase that product then the corresponding promo message will print on receipt. Similarly, a Promo message can also define for, a particular POS Category so that when a customer purchase product of that category then the corresponding promo message will print on receipt.